The cheese platter has to be a weekend rite of passage across the country. What’s not to love about a delicious smorgasboard of your favourite cheeses accompanied by an enticing and colourful display of sweet and savoury delights? If you love cheese, then you would appreciate what a thing of beauty a good cheese platter is for the eyes…and the palate! But how do you construct it so your #plattergoals are fully realised? It starts with amazing ceramics, and good quality cheese and produce. We show you how it’s done with fresh cheese. 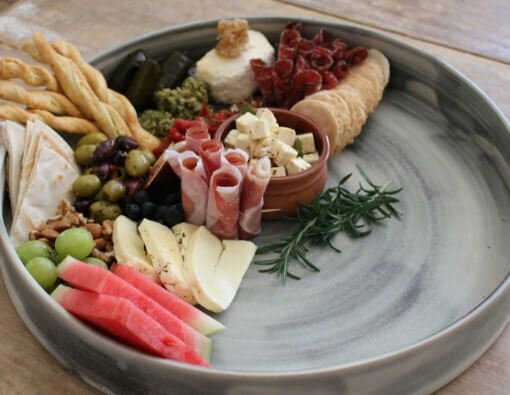 If you really want to make the incredible cheese platter that everyone will be oohing and aahing over, you need to think about what it’s presented on. We can’t stress enough how much better everything looks when photographed on beautiful ceramics. 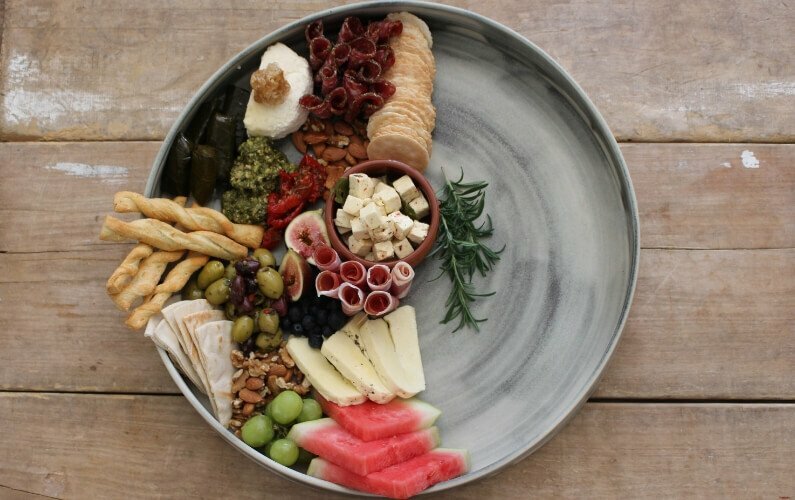 The photos in this article case in point 😉 If you have a light cheese – a dark platter will look striking, or you may want to use a rustic style cheeseboard. 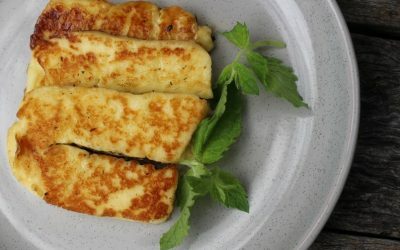 A matte plate really sets off the creaminess of the cheese, and looks particularly lovely with our minted halloumi. If you splash out on at least one great plate for entertaining, we guarantee you will not regret it. The size of your plate will determine the range and number of cheeses you select. When constructing your platter, think first of your main ingredient – cheese. Whether you mix up fresh or aged varieties may come down to the size of your platter, and the other produce you’re working with. If you have a small plate, it’s a great idea to provide only one or two cheeses. Choose cheese across a set theme. (For instance creamy cheeses or perhaps one or two fetta varieties). This will allow you to more easily match up accompanying ingredients around it without overdoing it and confusing your cheese-loving guests. For a large cheese plate, you’ve got room to cater for all. You could split your plate and accompaniments if you have two very separate cheeses you want to showcase. We may be a little biased, but we love our fresh cheese on a cheese platter. Sometimes it is great to not use the typical brie or cheddar and come up with exciting ways to pair fresh cheese with produce. Think of ingredients that really compliment the cheese you’re serving. Produce could be either sweet, savoury, tangy or umami. Try not to compete with the cheese, but use the produce to really bring it to life. 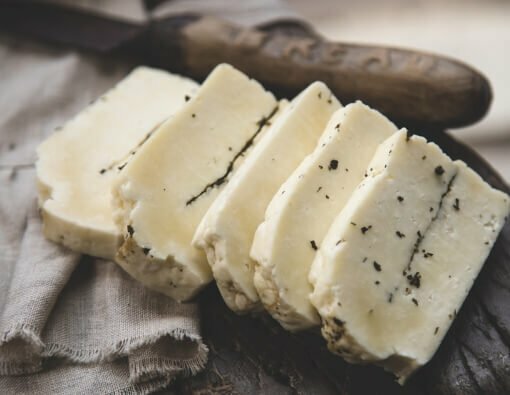 Here’s some tips on using fresh cheese, which when done right, are a modern and beautiful way to add to your cheeseboard. Creamy ricotta is a versatile addition to your cheese plate. Texturally, it spoons beautifully onto a cracker or crusty baguette and takes on the flavour of whatever you serve it with. We love ricotta and honey. 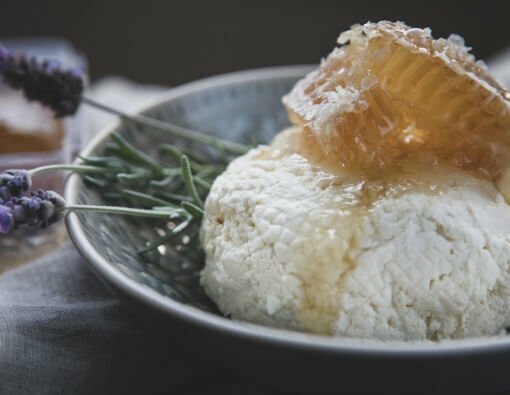 Honey can be baked over the ricotta, or simply drizzled to serve. Ricotta is lovely with figs and also pairs well with roasted tomato. 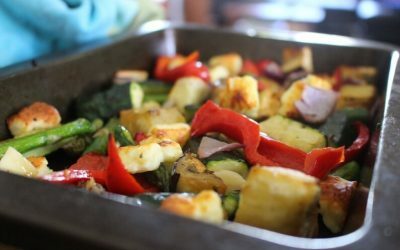 Or mix it with some delicious fresh herbs and a drizzle of good quality olive oil. Strong and lively fetta is always a winner on the cheeseboard. Use different varieties for a range of options. A garlicky, peppery marinated fetta goes beautifully with your antipasto ingredients of meats and marinated vegetables. It pairs well with a thick garlic cracker or toasted baguette. 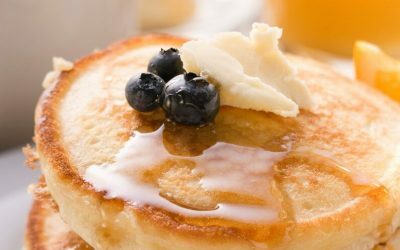 For traditional fetta, you can take it to either the sweet or savoury edge with delicious results! We also love honey with fetta, a fig paste or jam, or a balsamic glaze which marries well with the strength of fetta. Of course, some olives and olive oil are always going to be a winner. 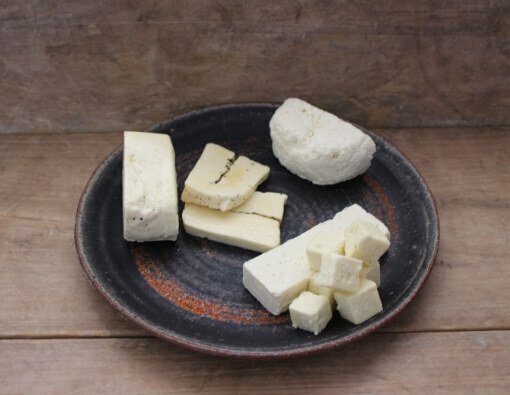 You may not realise that halloumi has a place on a cheeseboard, but we can tell you it is a great addition! 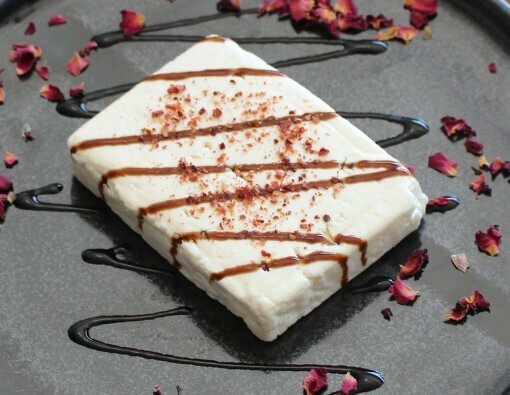 One of the more traditional ways halloumi is served in Cyprus, is simply sliced with some mouthwatering watermelon. This is particularly lovely with a little mint (or you can use our minted halloumi). Little cubes of grilled halloumi served with some grilled chorizo on toothpicks are always a nice little side addition to your plate. These warm little delights don’t usually last very long, and if your nibbles are serving as more of a meal, this is a great way to fill them up! You could also add in a capsicum dipping sauce for added flavour and texture. We eat with our eyes, and this is so true of a cheese platter. If you have a beautiful plate or board, don’t over fill it. Let the plate have its moment too, as we have done here. The plate is full on one side, leaving breathing space on the other side for the ceramics to shine. This ensures the presentation looks abundant and oh-so appetising. Underneath the plates in these photos are the original cheeseboards we used to mature the cheese on way back when. We used to wrap the ricotta in plastic and brown paper and they would be stored on these boards. Nowadays, they must be stored on metal, but it’s nice these gorgeous boards are still coming in handy now and then. The gorgeous plates we have featured in this article are courtesy of local potter A Ceramics, in West End. This beautiful local pottery is produced by Anna Markey. The high-fired stoneware Anna produces is designed for everyday use, and she also produces a range of architectural pendant lights, a collaboration with her brother James Russell. Anna loves creating glazes and exploring the fit between colour, texture and feel of the glaze on the clay. Much of Anna’s work is custom. Her pieces are not created to be matching sets, although many of her pieces belong in little families of similar colour or texture. Her amazing plates are beginning to populate the restaurants of many prominent chefs across the country, and we were delighted to be able to use these gorgeous plates in our latest photo shoot. The warm lush finish is such a beautiful texture for our cheeses. Want some more ideas on entertaining with cheese?